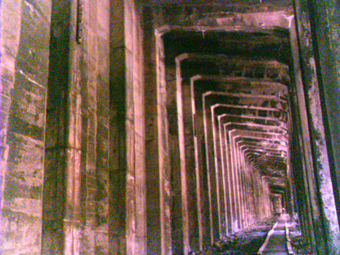 In 1929, the Great Northern Railroad built a second Cascade Tunnel near the first. At 7.8 miles, it is the longest railroad tunnel in the United States. 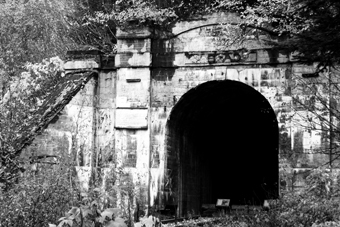 Once this tunnel was finished, the railroad abandoned the Wellington tunnels and rail lines. 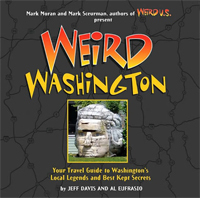 In the 1990s, the U.S. government built the Iron Goat Trail, which begins at Martin Creek, near milepost 55 on Hwy 2, and runs through Stevens Pass to the Wellington ghost town. Visitors can see the remains of the old rail lines, supporting structures and a train crash at the foot of the canyon. I walked through one of the tunnels with some friends. There was no electricity, so we relied on headlamps and flashlights. Near the tunnel entrance and just off the tracks we found a built-in room, which was probably created for railroad employees. We could see someone had been holding parties there: they left behind beer cans, dirty blankets and other things. We continued walking through the tunnel for what seemed like an hour. It was cold and damp, and at one point we encountered a fog bank. After a while, we came to a strange modification to the tunnel. It had been blocked by a partition that was made of wood and covered with corrugated metal. There was a small door in the wall. “Wait till you see what’s on the other side,” my friend Ross said. We walked through the open door and came to the rotting remains of a wooden platform, and the walls of a small shack. There was lots of fiberglass insulation, and oddly, someone had strung lines of high voltage conduit along the walls of the tunnel. From what I know about wiring and construction, I guessed this all was set up in the late 1960s or 1970s. We walked for as much as another half mile before coming out of the tunnel. The wiring, insulators and conduit ran along its remaining length, and we also found two or three concrete pads along the way, which had been poured directly on top of the train tracks.